In 2019 the world economy will see a recovery momentum while the Chinese economy will maintain its long-term development prospects with resilience and great potential. However, there are both external uncertainties and internal downward pressures. The new year marks the 70th anniversary of the founding of the People's Republic of China in 1949 and is a key year to achieve the goal of building a moderately prosperous society in all respects by 2020. China is expected to achieve 6.3-percent economic growth, follow a sustained and healthy development path, and maintain social stability. China's economy has entered a new era of high-quality development where domestic demand is the main driving force and the service sector the leading industry. This is attributed to supportive state policies, the impetus provided by reform, the dividends of opening up, a huge market potential, as well as economic stability and resilience. However, the global economy faces increasing risks of adjustment as the external environment undergoes extensive and unprecedented changes. Protectionism is surging in trade and investment and major countries are tightening their monetary policies. In the domestic market, impacts of the trade friction between the U.S. and China have begun to show. 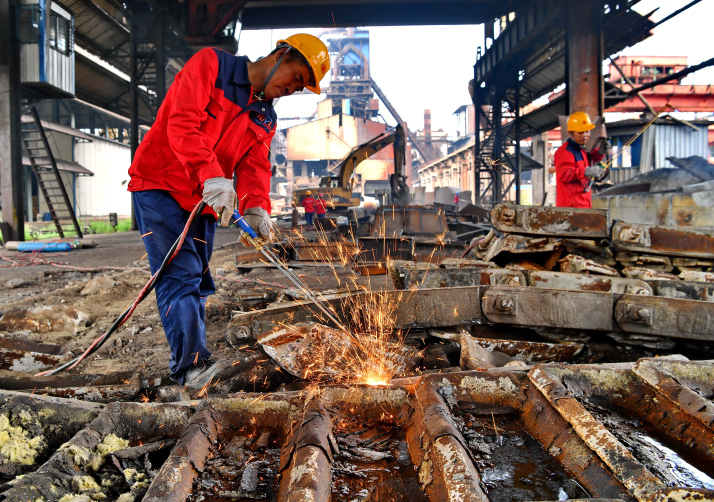 Some enterprises are suffering from operational difficulties, industrial structures need reconstruction, and issues such as financial disturbance risks have led to a rising downward pressure. On the issue of completing the building of a moderately prosperous society by 2020, the goal of doubling the size of the Chinese economy in 2010 can be realized if the average GDP growth rate in 2019 and 2020 reaches 6.1 percent. So, China's economic development remains within a reasonable range. From the perspective of high-quality development, it's essential to avoid excessive economic growth as moderate and reasonable development helps to optimize the economic structure and improve efficiency. As for the need to create employment, the 6.3-percent growth rate forecast for 2019 is poised to create 11 million new jobs. The estimation is based on the past five years' experience when each percentage point of economic growth was able to generate 1.86 million new jobs. China's economic problems are both short-term and long-term, cyclical and structural. The main problem lies in the supply-chain structure, which has led to production slowing down. However, the Chinese economy has entered a new era where high-quality development of manufacturing can be a breakthrough. Industrial production remains stable though showing a trend of slowing down. The advantageous factors supporting industrial production include reduction of the value-added tax of the manufacturing and transportation industries, the fast development of hi-tech manufacturing and equipment manufacturing industries, and the advancement of new growth drivers. However, there are also constraints such as the impact of the China-U.S. trade friction, rising financing, labor and land costs, and the pressure on companies to comply with environmental protection. The service sector will experience fast growth with foreign investment beneficially supplementing capital and management. The emergence of new technologies such as information and digital technology, artificial intelligence (AI) and block chain technology will boost the modern service sector. Booming new business models will help to improve efficiency and tap the potential of resource allocation. The market for consumer services such as tourism, pension, medical and healthcare is booming. However, the supply of services is still inadequate to meet the growing needs of the people. High-quality development of manufacturing will be a breakthrough. The Central Economic Work Conference, the annual meeting that sets the national agenda for the economy and the banking and financial sectors, has laid down comprehensive guidelines on developing the manufacturing industry. First, it's essential to encourage extensive integration between advanced manufacturing and modern services. Second, a mechanism should be developed to select the best enterprises and eliminate inferior ones. Third, it's also important to improve the innovation ability of the manufacturing industry, and construct an open, coordinated and highly efficient technical research platform. In the face of a fierce and complex external environment, it's necessary to strengthen counter-cyclic adjustments and continue a proactive fiscal policy and a prudent monetary policy. It is also necessary to adjust policies in time, stabilize the overall demand and encourage the formation of a strong domestic market. Unleashing the consumption potential plays a fundamental role. China ranks high in the world in terms of its market scale, and will show greater potential in the future. It's necessary to satisfy demand and improve product quality, enhancing the development of service sectors such as education, pension, healthcare, culture and tourism. As for the consumption environment, the new individual income tax reform should be implemented effectively to increase people's consumption capacity. With a low level of unemployment and flexible employment channels, Chinese consumers have a solid employment foundation. The reduction of tariffs on certain consumer goods has also added vitality to the consumption market. Technologies such as digital technologies and virtual reality have facilitated new consumption businesses and models, improving the extent of convenience. However, the domestic consumption market faces constraints too. The median share of per-capita urban disposable income has fallen; the income of middle-income groups that influences middle- and high-end consumption has declined. Assets have shrunk with the fluctuation of the stock market, and the price of properties and rents remain high, putting pressure on consumers. The cooling down of commercial residential housing prices has weakened the consumption of related products such as furniture and home appliances. Factors such as purchase restriction and uncertain market expectations have also hit consumer demands for vehicles and restrained the vitality of the car market. But overall, there is a huge domestic consumption market potential, especially consumption of services, which has kept a relatively high pace of growth. The demand-and-supply scenario in the manufacturing industry is striding toward middle and high-end development with investment increased in major science and technology projects. Investment in tackling the key problems of core technologies and upgrading independent innovation has increased. As the guidelines for private enterprises are implemented gradually, the social environment for investment will improve. Foreign trade imports and exports will face slowed-down growth. The U.S.-dominated new round of bilateral and multilateral trade rules has made major countries adjust their fiscal and monetary policies from loose to tight, leading to a retarding trend in the global economy. China has taken the initiative to intensify reform, and expand the scale and standard of its opening up. It is building the Belt and Road Initiative with other countries to provide opportunities for international capacity cooperation. With the release of intellectual property rights protection rules, China's attractiveness to direct foreign investment will be enhanced. However, the trade friction will gradually impact Chinese exports. As a result, China's external demands will cool down.